Musical theater performer Jocelyn Duford’s acclaimed one-woman cabaret returns to Concord! 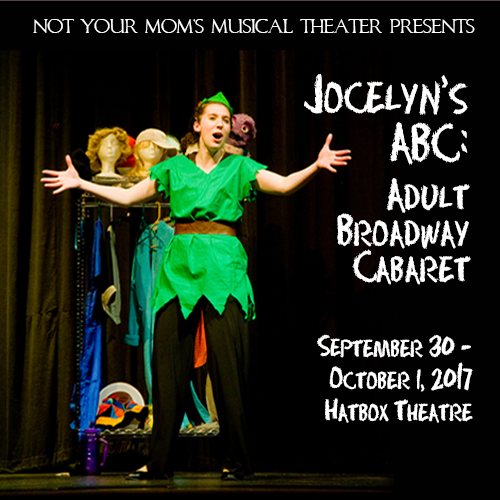 Actress and singer Jocelyn Duford, brings her acclaimed one-woman show, Jocelyn’s ABC: Adult Broadway Cabaret, to Concord this September. The show, which features a musical theater song for each letter of the alphabet, is at times hilarious & poignant as Jocelyn changes wigs, costumes & characters while showcasing the talent and artistry she is known for. The solo performance draws on music from both well-known shows like Gypsy and Peter Pan as well as lesser-known shows like See What I Wanna See and Bring It On. Jocelyn is a performer, educator and teaching artist and the Artistic Director of Fairy Tale Players. Jocelyn is also a member of Not Your Mom’s Musical Theater’s touring company, and she has performed her solo shows from Derry to Colebrook. Jocelyn will be accompanied by pianist Jamie Feinberg. The show is presented by Not Your Mom's Musical Theater, a company dedicated to bringing quality lesser-known musical theater & musical theater history to New Hampshire audiences (and beyond). Learn more about Jocelyn at www.jocelynduford.com.